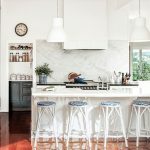 Having already worked on the living zones of this Yeronga home, interior designer Estelle Elliott completes this long-term project with her client's much longed for kitchen overhaul. 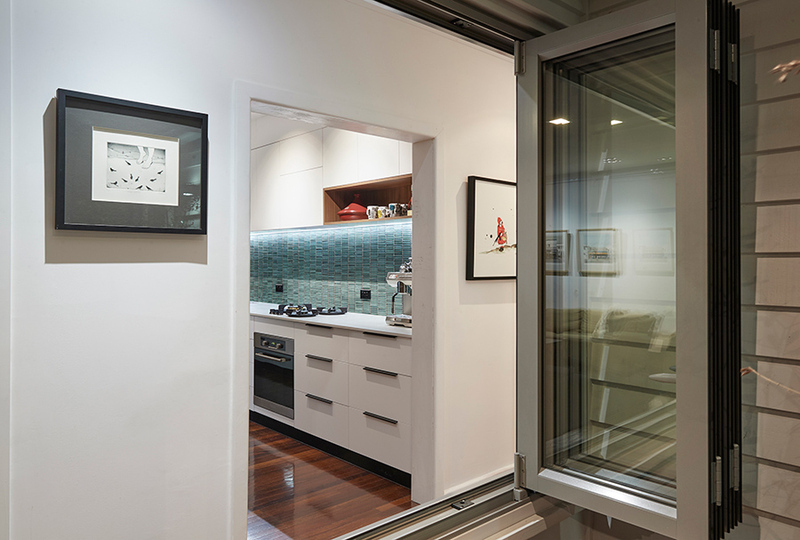 The residence has magnificent Brisbane City views from the kitchen area from its elevated ridge line position, so a key objective for Estelle Elliott Designs was to open the space to provide a more cohesive living and entertaining area. 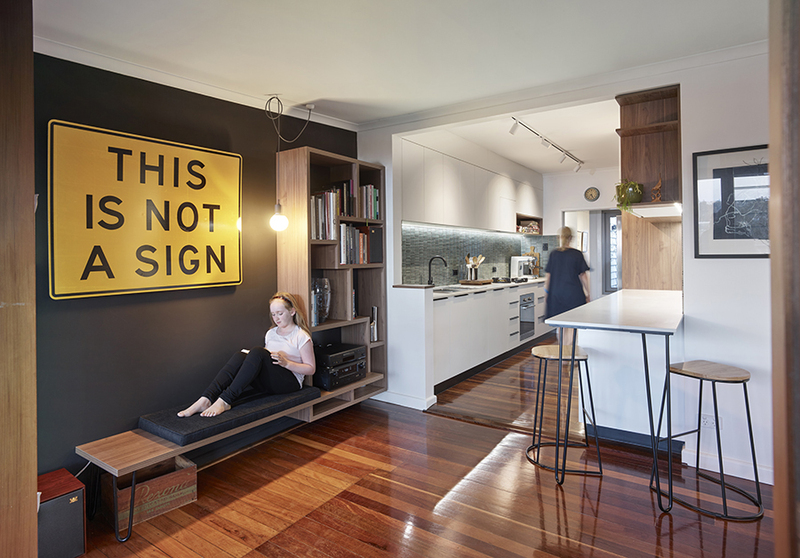 The homeowners already had an interesting collection of existing artworks – including the fab yellow and black “Pareidolia” sign by Alan James, along with the “Stitched” by JM Macleod next to the breakfast bar, and the “West End – Mick’s Nuts” and “West End – Bent Books” by Mr Smudge above the lounge – complemented by the variety of modern vintage furniture and décor elements, all of which inspired the new kitchen design. 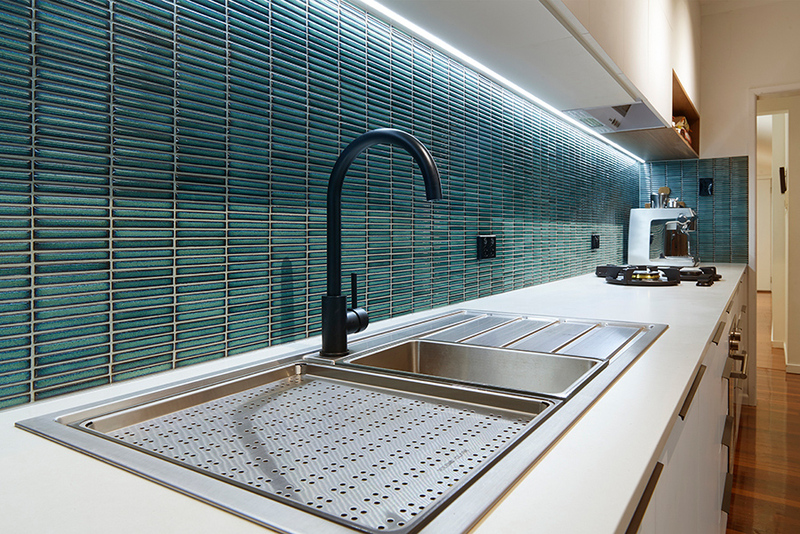 The colour palette was kept light to enhance the size of the space, with the green vintage-style finger mosaic splashback tiles a prominent feature, lit using LED strip lighting integrated within the overhead cabinetry. 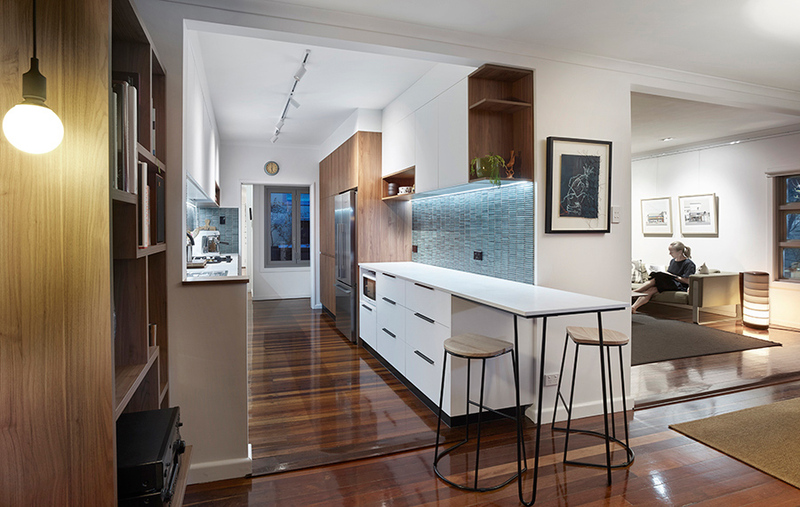 A fresh contrast has been added with the warmth of timber flooring and the timber shelf openings, which visually break up the expanse of overhead cabinetry that extends upwards to the ceiling, whilst providing ample and easy accessible cupboard storage. 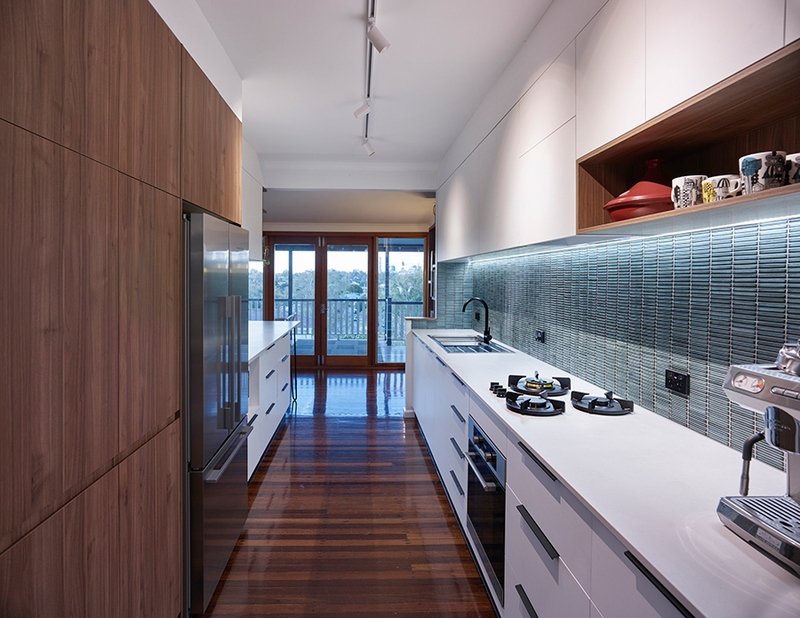 “This also provides an illusion of height with the continued clean lines,” adds Estelle. 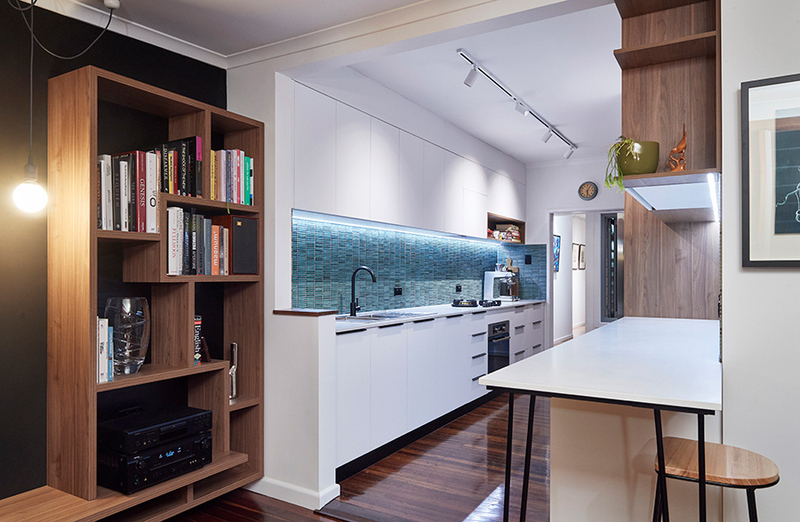 By incorporating some minor kitchen entry wall modifications, benchtop space was extended to the adjoining sitting room, creating wonderful connectivity with the living zones while also allowing the parents to supervise their daughter’s homework whilst dinner preparations are underway. 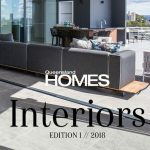 A new custom designed built-in bookshelf and bench seat give this space further usefulness, for the purpose of reading, relaxing and listening to music. The project wasn’t without its challenges. 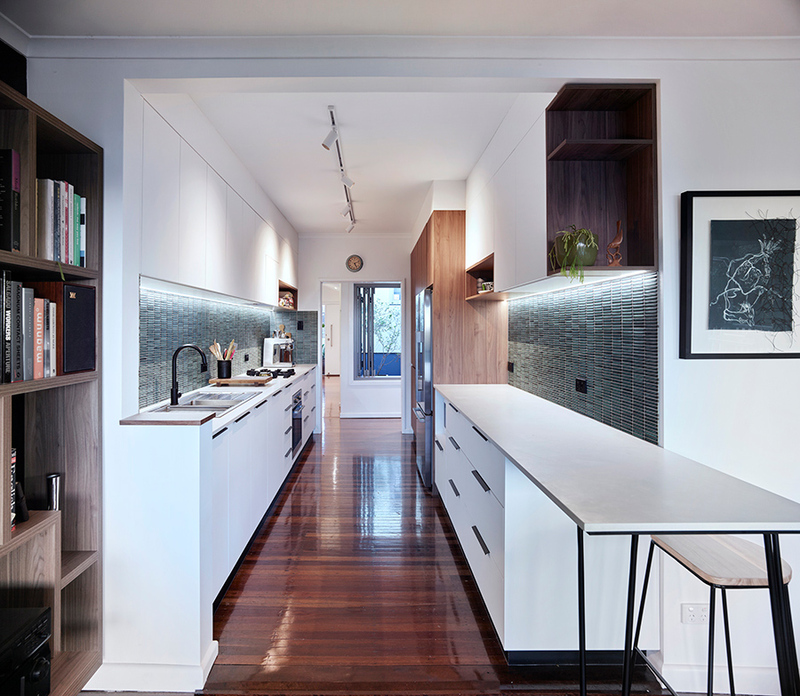 “Being an older original house with provision renovations, the existing walls and floor levels were so out of square in every direction, which made it difficult to get cabinetry level, with gaps in the wall varying vertically and horizontally. 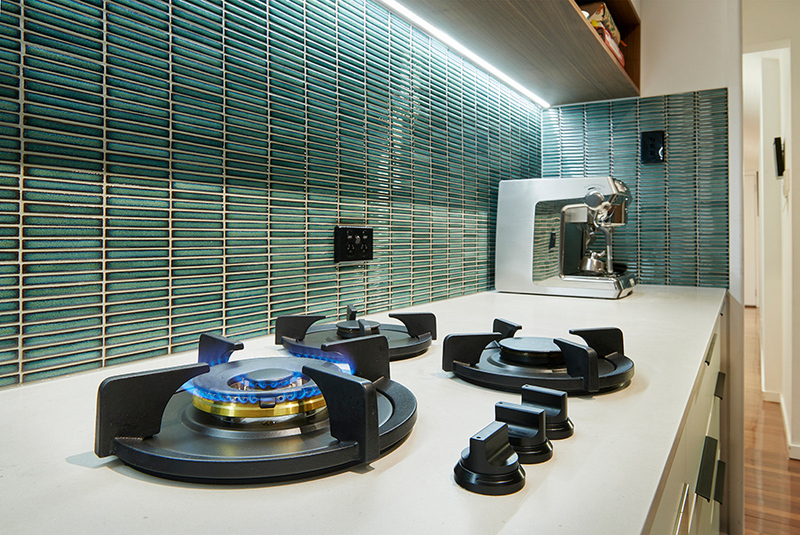 To overcome this, we set back the scribe rails to provide a shadow effect,” says Estelle. 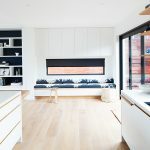 What was previously a kitchen with limited connectivity and use has now been transformed by Estelle Elliott Designs into a welcoming, functional and beautifully illuminated addition to the house for both entertaining and casual living.